The famous phrase, “The history of the world is but the biography of great men,” was inspired by this book [Heimskringla]: Snorri is indeed a deft biographer. And yet, although he has a saga we can read, most of us don’t know a lot about his life (the saga is rather sad and bloody, and was written by a relation who disliked him. I confess I haven’t read it). 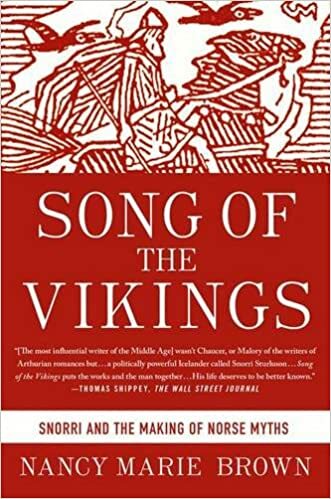 So Nancy Marie Brown, who wrote Ivory Vikings, which I reviewed not long ago, has done us a service by writing his biography for a modern audience in Song of the Vikings. The book begins with an anecdote about J.R.R. Tolkien and C.S. Lewis, and we learn much about the amazing influence of Snorri’s work throughout the world’s literature and art – for better and worse. This is all the more remarkable because his books weren’t even known outside Iceland until around the beginning of the 17th Century. I was very impressed by Song of the Vikings. Any reader interested in Norse history or myth will gain many new insights. Author Brown is a good writer and an impressive scholar. I recommend this book.